What does all of this have to do with multi-echelon optimization? Well, had the party been a little better organized, the network of friends could have better coordinated the event. Instead, each individual brought the item they were best capable of making without taking the interests and cooking talents of the other guests into consideration. The result: a terrible, disappointing buffet. Businesses too could find themselves in a similar situation. Before a final product is ready for the end customer, it will most likely pass through a complex distribution network including a range of central, regional and local distribution centers. If the various nodes within the network fail to communicate effectively, it could put the business in a real pickle. This is especially true when organizations consider improving supply chain performance through inventory optimization. For example, each component of the distribution channel is often treated as a separate island where inventory optimization decisions are made in isolation without considering the impact on other areas of the supply chain. While this may lead to individual warehouses achieving positive results, the total levels of stock within the network often remain exceptionally high. Much of this stock is the result of holding excessive safety stock. The supply chain is constantly subject to a host of risk factors including overdue deliveries, fluctuating demand and supply issues, so in order to guarantee availability businesses must maintain a certain level of protective buffers. However, uncertainty is rarely distributed evenly across the network and as a result a large part of this safety stock becomes redundant, at great expense to the company. However like a potluck, through better co-ordination it is possible to achieve more appetizing results. Multi-echelon offers a tasty alternative to conventional optimization techniques through taking a bird’s eye view of the entire network. Analyzing the whole network as a single can help reduce inventories by 15-20%. Multi-echelon questions whether it is more cost effective to store stock at the beginning of the supply chain or towards the end of the supply chain, closer to the customer. The concept makes it possible to analyze a variety of inventory configurations in order to determine the optimal stock situation. The distribution network is then better able to respond to customer demands, thanks to the improved flexibility. Furthermore, through reducing inventory levels in this way, capital usually tied into redundant stock can be freed up and reinvested: a considerable advantage in today’s climate. 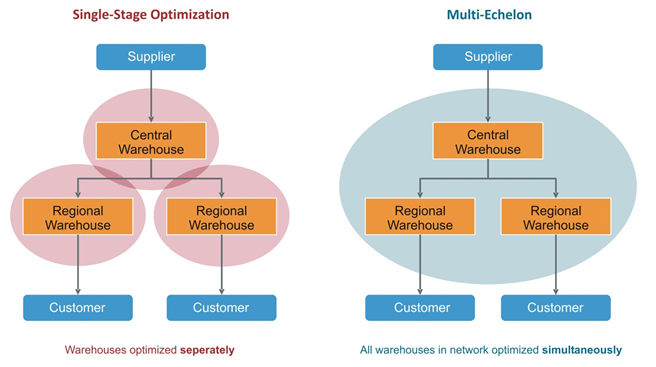 Multi-echelon optimization offers enterprises an innovative approach to effective network-wide inventory planning. Given the increasingly complicated production and distribution structures of enterprises, businesses that hesitate to implement such tools could end up leaving customers with a sour after-taste.